Officials at Oakfield-Alabama Middle High School in New York state have painted over the mural of a Pride flag citing issues with its size. An art student had painted part of the wall in the colours of the Pride flag. He was also planning on adding the words “love is love” on top of the flag as well as handprints of some of the other LGBT+ students, according to local news outlet Video News Service. But the student, who was not named in the media reports to respect his privacy, never got to finish the mural as it was painted over. The decision caused controversy, according to an alumni whose sister is currently a senior at the high school. Justice Rane Leisten posted images of the wall before and after the paint job on Facebook, condemning the school’s decision. “I know i went to a rather conservative school and I heard gay hate all the time; which is partially why i didn’t come out until after but really?? this is whats wrong with the world. they’re literally teaching kids to hate,” he wrote. “Painting over the flag is validation as to how they feel about gay people at that school,” he said in a video he recorded after his initial post. He claimed that his sister had to see a school counsellor after she stood up to one of the students who had criticised the Pride flag mural. “This was miscommunication with the student. The student was new to the school. We do allow our eighth-graders to paint a brick. This young man painted something larger than a brick,” Crumb told local news outlet The Daily News. The picture of the Pride flag mural circulating online shows it standing a few bricks away from the mural of a street lamp, but according to Video News Service the student would have had to submit a form before being allowed to paint one. Crumb denied that the school objected to the subject of the mural. 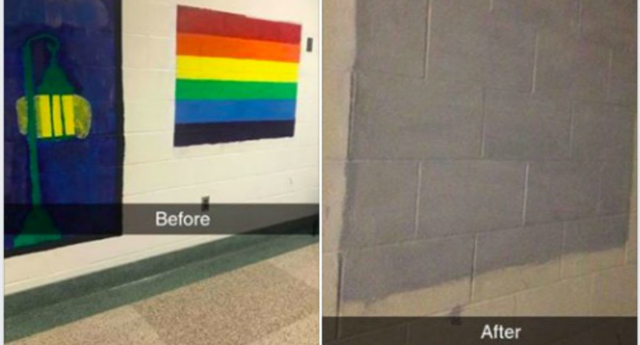 Given the opportunity to paint one brick of the wall, the student reportedly painted a hand in rainbow colours.